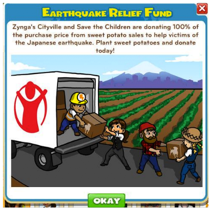 As we wrote a few weeks ago, Zynga launched a campaign with Save The Children to raise money via in-game donations in Zynga games like FrontierVille, FarmVille and CityVille for the relief efforts in Japan following the massive earthquake and tsunami a few weeks ago. Today, the social gaming giant is announcing that Lady Gaga has donated $750,000, through the sales of her Japan Prayer Bracelets, to Zynga’s fundraising initiative. She is also donating another $750,000 to the American Red Cross to support relief efforts in Japan. Through Zynga games including Café World, CityVille, FrontierVille, FarmVille, Words With Friends, Vampire Wars, YoVille and Zynga Poker, more than 250 million players had the opportunity to donate 100 percent of the purchase price of newly created virtual items to the fundraising efforts. Via Credits, Facebook donated money generated through the purchases to support the initiative. The Japan fundraising initiative isn’t the first charitable campaign for Zynga. Since October 2009, hundreds of thousands of players have raised more than $10 million dollars for international nonprofits through Zynga.org. And Zynga was able to raise millions for the relief efforts in Haiti last year. Lady Gaga recently sat down with Google’s Marissa Mayer for a candid talk about tech, music and YouTube.